On March 15, 2012, federal regulations with detailed Talking ATM requirements will finally be mandatory. The Talking ATM standards come at the end of a long (and continuing) road of grass-roots and legal advocacy by the blind community in the U.S. and around the globe. March 15, 2012 is more than twelve years after the first Talking ATM was installed in the United States. Tens of thousands of ATMs now talk, but still too many do not. 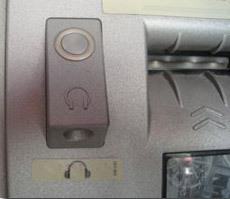 There are two parts of the Talking ATM regulations in the 2010 Standards for Accessible Design. The technical standards are found in Section 707 and prescribe details for features and functions such as audio output, user controlled volume, and input controls (keypads). The scoping standards, describing how many accessible ATMs are required, mandate “at least one” Talking ATM at each ATM location. The new regulations lag behind what is actually happening on the ground, where major institutions have recognized the importance of ATM consistency and costs savings when all machines are the same. Every ATM at major U.S. banks, including Bank of America, Chase, Wells Fargo and Citibank, is a Talking ATM. In 1995, on behalf of the California Council of the Blind and several blind individuals, Lainey Feingold and Linda Dardarian wrote letters to Wells Fargo, Citibank, and Bank of America explaining that blind people need access to ATMs as much as sighted people do. At that time there were no Talking ATMs in the United States, and, as far as we knew, the twelve Talking ATMs that had been installed in Canada as a result of blind community advocacy were the only accessible financial transaction machines in the world. Since those first letters in 1995 there have been tens of thousands of Talking ATMs installed in the United States and around the world. This is thanks to grassroots advocacy by blind individuals and their organizations, legal advocacy including Structured Negotiations and litigation, champions in the country’s largest financial institutions and technology experts. The U.S. Department of Justice regulations that are fully in place on March 15 will be another important step, albeit a belated one, in ensuring that ATMs are accessible to all. Too many ATMs in the United States and abroad are still off-limits to people with disabilities due to accessibility barriers. Hopefully the new regulations will help eliminate those barriers once and for all. Here are links to some of the Talking ATM Categories on this website (category pages provide a short summary with links to the full posts). Twenty two press releases about Talking ATMs that have been issued as a result of Structured Negotiations. Twenty Talking ATM Settlement Agreements reached through Structured Negotiations. This is a post about regulations in the U.S. about Talking ATMs. The new regulations are mandatory beginning March 15, 2012. They have detailed rules about Talking ATMs. Talking ATMs make it possible for blind people to independently use ATMs.